Lucky étoile, étoile, star ou The Melancholy of Haruhi Suzumiya?? are yu a lucky étoile, étoile, star ataku?! le choix des fans: yeeeeeeeeeeeeeeeeeeeeees!! Lucky étoile, étoile, star ou the Melancholy of Haruhi Suzumiya? 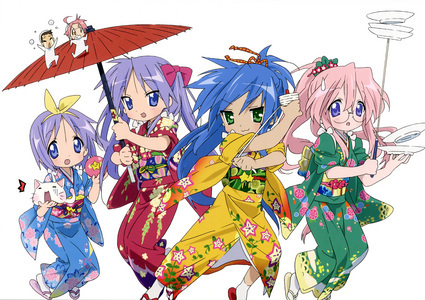 le choix des fans: Konata-chan! I l’amour to play video games and read manga! favori Lucky étoile, star character of all times!! Is there a Lucky étoile, star Manga? Is there a Lucky étoile, star manga fan club that i can join? "Correct. toi win. OK, toi leave this." the suivant time that i invited my Friends over, this time i hid my scetchbook, so now no one can see what ive drawn. my Friends were knocking at the door. me: why were toi knocking at my door with a shovel? I made a fan club about Lucky étoile, star Manga. a comment was made to the poll: Lucky étoile, étoile, star ou The Melancholy of Haruhi Suzumiya?? a comment was made to the poll: are yu a lucky étoile, étoile, star ataku?! a comment was made to the poll: Lucky étoile, étoile, star ou the Melancholy of Haruhi Suzumiya? a comment was made to the poll: Who are toi most like? a comment was made to the poll: Do toi like the dubbed version? What color are kagami's eyes?